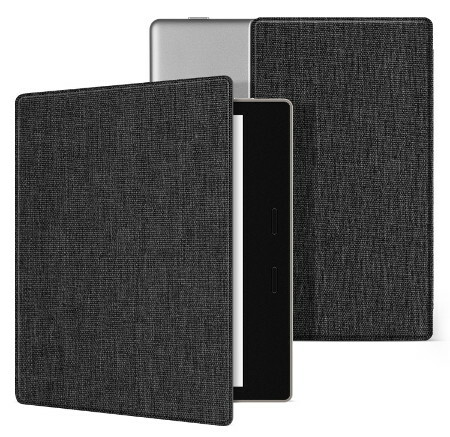 While we’re on the topic of covers and cases for the Kindle Oasis 2 this past week, some have mentioned the new Ayotu covers that fit the unique design of the Kindle Oasis. The Ayotu cases are similar to Amazon’s original covers, except they lack the diagonal crease across the center that allows the cover to double as a stand. The new Ayotu covers are the first to copy Amazon’s concept of having the back attach with a magnet that fits into the contoured design. That way you can easily take the cover off when reading in order to use the Kindle Oasis how it was designed to be held. The covers also have the auto sleep/wake feature to automatically turn the screen on and off. They come in 16 different colors and patterns so there are plenty of options to choose from. Some are available in PU leather and others are fabric. Most are priced at $20.99-$22.99 with free shipping, some are a bit higher with shipping. Unfortunately most of the reviews at Amazon are for a previous product, judging by the dates, so they aren’t of any use unless you sort by most recent to read the latest reviews. If you try one of these covers let us know what you think. Interesting that they use a gel adhesive for added strength. Lots of people were complaining about the magnets not being strong enough on Amazon’s original covers, but perhaps it’s a limitation with the magnet on the Kindle Oasis, although I don’t have any problems with mine. I can pick up the cover by the flap and dangle the Oasis without it coming unattached, even when shaking it it stays on. Do you think you might review one of these? Sorry but there just isn’t a lot of interest in case reviews so I do them rather infrequently.